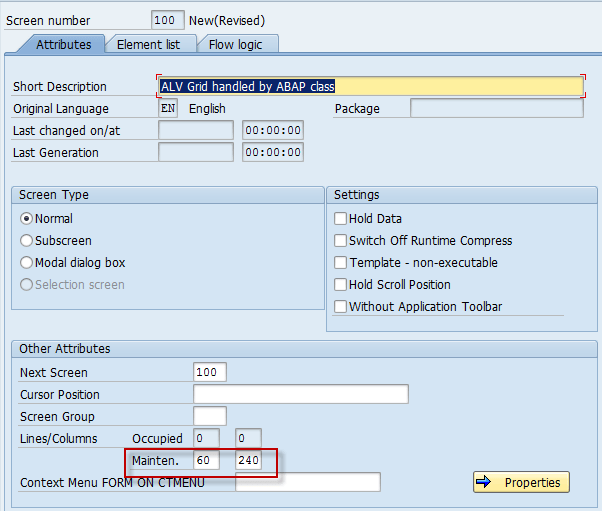 In SE80 create a function group with one function module and one screen. The function module will be the entry point from the class. The screen will be used to draw elements on the screen. 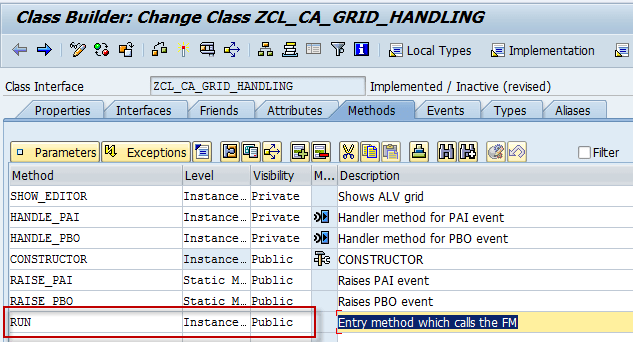 The screen elements will be manipulated from the ABAP class code. Now we create the screen 0100. Please note the size of the screen – this is because we would like the ALV grid to be stretched across the whole page and we don’t want double scroll bars (issue when grid is too large) – this will require also modification in the screen layout (explained later). lt_ucomm TYPE TABLE OF sy-ucomm. 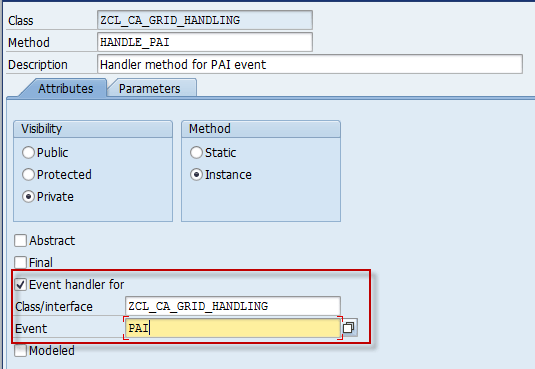 APPEND INITIAL LINE TO lt_ucomm ASSIGNING <fs_ucomm>. SET PF-STATUS 'MY_PF_STATUS' excluding lt_ucomm. 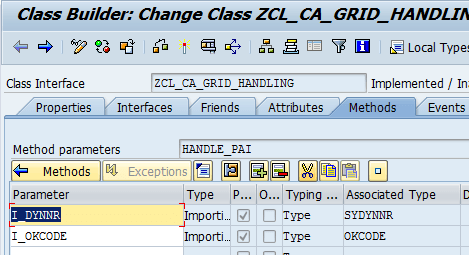 zcl_ca_grid_handling=>raise_pbo( i_dynnr = sy-dynnr ). WHEN 'CANCEL' OR 'LEAVE' OR 'BACK'. 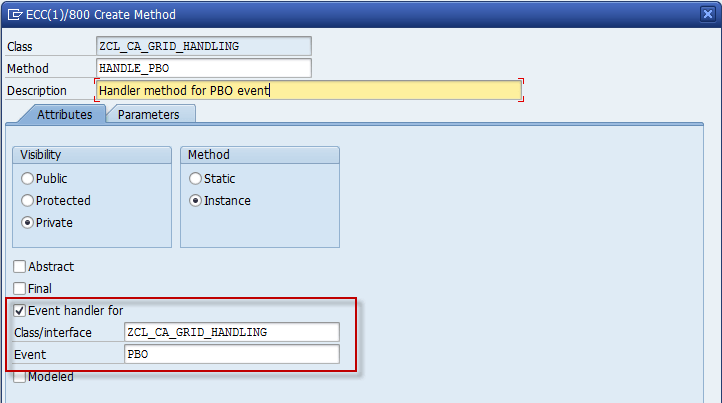 Method SHOW_EDITOR in HANDLE_PBO is a method for creation of the container object, ALV grid object and displaying it. 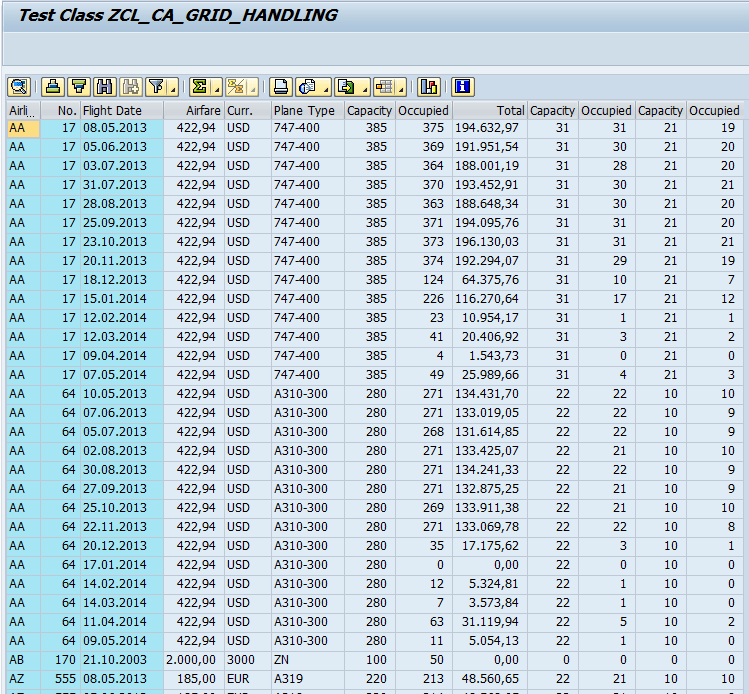 SELECT * INTO TABLE mt_data FROM sflight. Voila ! 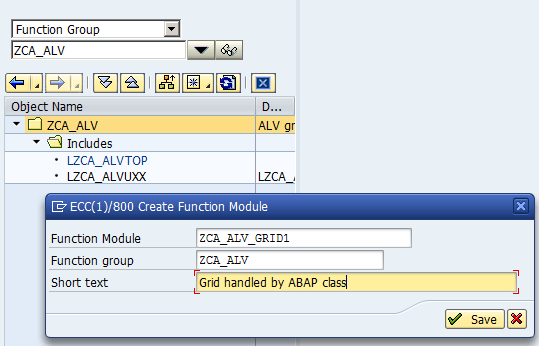 We have fully functional ALV handled by an ABAP global class. This entry was posted in ABAP, ALV, Development and tagged ABAP, ALV, OO ABAP by Spider. Bookmark the permalink. Thank you, this info was very helpfull. Good article, thanks. Say if you wanted to process all the fields on the screen – for example, save all the field values into a database table. Would you need to pass all the values via the raise_PAI event? Code in this article was used just to manage one ALV grid by a global class. But I believe there’s a was how to access screen components dynamically so it should also be possible to access them from the global class without a need to pass their values back and forth from/to the dynpro. I’ll check it out and let you know if it’s possible (in another article) or I’ll leave a comment here if this is not possible/not practical.